The interest in music transmitted across cultures in Africa brings us to the largest city in Cameroon and Central Africa’s largest port- Douala. With an estimated population that surpasses 3,000,000 inhabitants now, the cozy tropical climate and friendly people have not thoroughly faded out the sting of the period of influx in the past by Portuguese, British, German and for a stretch of time French settlers. This is expressed in the complex societal and religious lifestyles, and even affects the music. Several genres put the country on the rhythm map. These include Makossa from Douala, Bikutsi, Makassi, Asiko and Tchamassi. 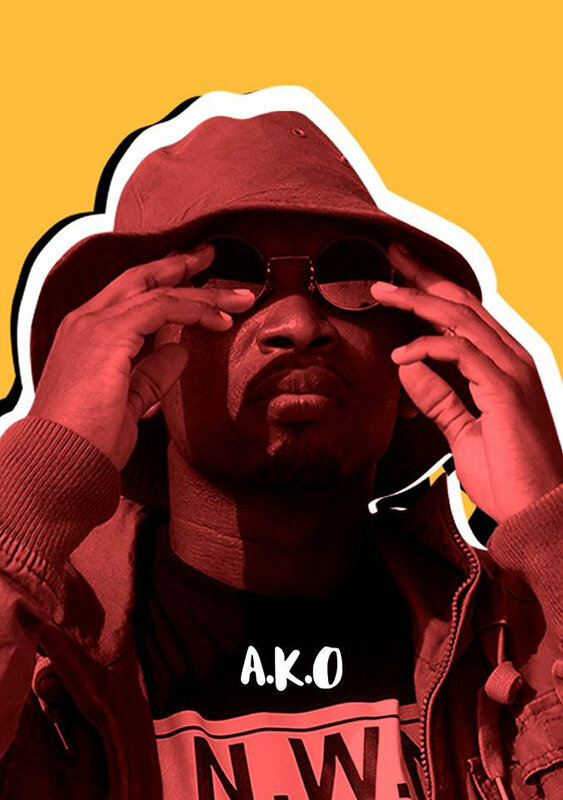 What is as well profound among the youth is the hip hop stream, where rapper A.K.O Soldier aims to bridge the gap between contemporary vibes and the indigenous cadence. A.K.O started making music seriously in 2009 soaking inspiration from Tupac’s All Eyes On Me. He got hold of the CD when his brother returned from Europe. The artist got connected to a record label which wanted to put a compilation out. This garnered him some recognition in the country when the album was put out in 2009. This “street” album is The Prologue, and contained ten tracks. “It presents the personal side of me which draws from the American hip hop culture which is expressive for the black community. 2009 gave us territorial recognition. Prior to this, there was no known anglophone rappers in the industry. The four(4) artists including me presenting that work was major.” The rapper states candidly. KW: A.K.O, tell us about the terrain out there in Douala and how you make your work accessible to the target audience. A.K.O: In Cameroon, we have 10 provinces; 2 speak English. Douala is a French-speaking city despite it being a multi-cultural terrain. The main language is called Sawa. The people here have been engulfed in ‘modernism’ now. It is a pluralistic, economically vibrant city with the biggest market space in Central Africa. In the early 2000s, if you’d presented yourself as a rapper they wouldn’t respect you. Now the perspective is changing. Jovi has worked with Akon and M.I. Stanley has worked with Sarkodie. In terms of rap, other cities like Boya is also responsive or Yaounde(capital of Cameroon). KW: In the recent talk organized by Accra[dot]alt, renowned author Ayi Kwei Armah mentions that “If ever we wake up, we’d realize that it is absurd that we need to switch language whenever we get to a border.” He speaks of the negative wave that disconnects nationalist states from a singular African interconnected possibility. Is the language factor a thing in Cameroon music? A.K.O: A lot of guys work with their local languages but there was not much respect for that. Artistic direction affects things a lot, delivery and catchy hooks especially in the entertainment scene. No artists rights, royalties. The government is not helping so it’s more of a sole proprietor business. KW: What about the bodies concerned with music and culture in and out of Douala? A.K.O: The bodies in charge of culture have been very corrupt. Each time a new organization is created, the previous one does not recognize them. The artists are like grass that two elephants are fighting on. I was born in Douala on 5th January, 1985, and had ‘average’ education. I dropped out of school but went back and recently graduated with a degree in human resource. My parents won the American lottery in the early 2000s. They are now retired and are looking after their grandchildren. Hip hop is good for the new African drive of consciousness and there are of course bad nuts but the real ones will be recognized with time. KW: The difficulties with having a solid backing from the governments is persistent all over the continent but more intense in some parts. How do you intend to spread your voice outside these barriers? A.K.O: I see myself as an entrepreneur. I want to create an app- a network. I used to have a dry cleaning shop two years back. It(the entrepreneurship spirit) is beginning to manifest in the accessibility to my music since I’m creating a strong team to promote the music. We decided to release a thousand free CDs and the next project will be double that. No one has done that in Cameroon. We intend to share it(the CDs) in a more organized manner this time around; to take contacts of the people we share music to, follow online and ask them to follow us back. We plan to organize data better now. For now it’s more of promotion than marketing. There are very rare performance platforms here and artists look up to corporations a lot. Most artists think about fame and girls. They organize performances with their cliques/clans and lobby this through circles. Also, openings in the media or ministry of culture helps to open doors for selected artists. KW: Who and what inspires your work? A.K.O: I listen to Nas, J. Cole and Kendrick Lamar. My first EP made me concerned more about my identity, back to scratch, to evaluate myself if I really wanted to be in the industry in the long term. KW: Who does A.K.O make music for? A.K.O: You cannot put my music in a box. Music helps me to talk to all types of people and it is mostly the background music- traditional music for old folks and electronic music for the youth. We mostly work with the drum. Me being trilingual also helps- I can rap in French, English and Pidgin. With over 200 ethnic groups in Cameroon alone, they play all kinds of music. Sarkodie’s music is making waves on radio and streets here. Makossa is big here also. They grasp a genre and everybody follows that trend for a long time till they get attracted to another. KW: Beyond the rough practices of government bodies and shortsightedness, how do artists survive out there in Cameroon? A.K.O: Artists here pay for the studio, the beat, and pay for the video to be made. Local video channels… they pay for that also. We have Trace Urban(most viewed music TV channel in Cameroon and in other francophone countries) and Trace Africa. I was discussing with my manager last time; Cameroonians promote more foreign music than their own music. MTV Base Africa shows more Nigerian content than any other country’s music. It is depressing to find some of these media outlets expect payola from a local artist before they promote your music, but they play foreign artists every time. Musicians don’t print CDs. They push for air play and then wait for promoters to call them for shows or collaborations. KW: What next should Africa and the world be expecting from your movement? Any new visuals? A.K.O: I’m working on my second EP with the same energy but vibes are going to change. I’m working on Afro beats, Rock, Hip hop, R&B and Pantsula. It will be more open to the youth, more live; violins and opera tunes. This is a risk I’m taking with investments to make it cross boundaries. The next video is Plan O- we shot it in one ghetto in Douala called Babanda. It speaks about how everybody is trying to survive and sometimes end up caught in the wrong things. I was inspired by a cab driver here. He said that Libya was better than Cameroon at war even when we had peace. With police asking for bribes on the highway, etc. So there’s a lot of drama depicting these things in the visuals. I personally play all the roles in the video. A.K.O: We always try to bring the African image in our work.